Happy Sunday everyone! Michelle and I are super excited to announce the new monthly challenge over at Jaded Blossom!! This months challenge is to create a Valentine themed project. It can be a card, favor, tag etc. The only requirement is that it must have a Jaded Blossom stamp somewhere on it. Easy! :) There is a prize for the winner! Now on to my project.. 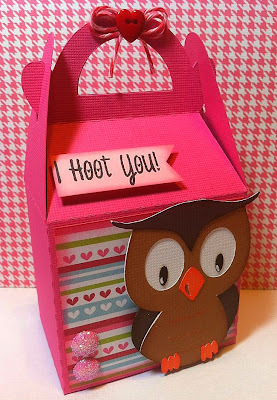 I cut this gable box and the owl from Silhouette Studio on my cameo :) The stamp is from "I Hoot You" petal. This is adorable!!!! I love it!!! Candace this turned out so stinkin cute!!!! So cute Candace! Love it!